A possible future for Madison Ave? Back in November the city of Albany was set to present the much-awaited plan for the Madison Ave Road Diet. And then, just a few days before the public meeting to announce plan, the city canceled the announcement and there's been no public word since then about what's up. There are a bunch of interesting ideas wrapped up in the road diet, among them that the city can reduce the number of travel lanes to slow speeding vehicles while at the same time maintaining overall volume and flow of the corridor. But the idea that's gotten the most attention is the possible inclusion of protected bike lanes -- both from advocates who say the lanes would be a big step forward in the city's effort to become friendlier to cyclists, and from skeptics who worry about the cost of maintaining the lanes and their effects on the number of parking spaces. It's hard to say what exactly is holding things up. A spokesman for mayor Kathy Sheehan told us this week that the city is still gathering info from its consultants on the project and there weren't any new developments. But there's a sense among cycling advocates that the bike lanes are probably a sticking point. So now those advocates have a new pitch that is, essentially, the city should do an experiment. "On our side we have a lot of evidence, statistics [of the benefits of protected bike lanes], but they're all from other cities. And Albany is not yet a great biking city, so we don't whether or not the lessons of other cities will apply to Albany," said Jason D'Cruz, a member of the Albany Protected Bike Lane Coalition, to us this week. "On the other hand, the people who are opposed have common sense conjectures about what might happen if you reduce the number of travel lanes, what might happen in the winter. But they don't really have any evidence about what will happen." 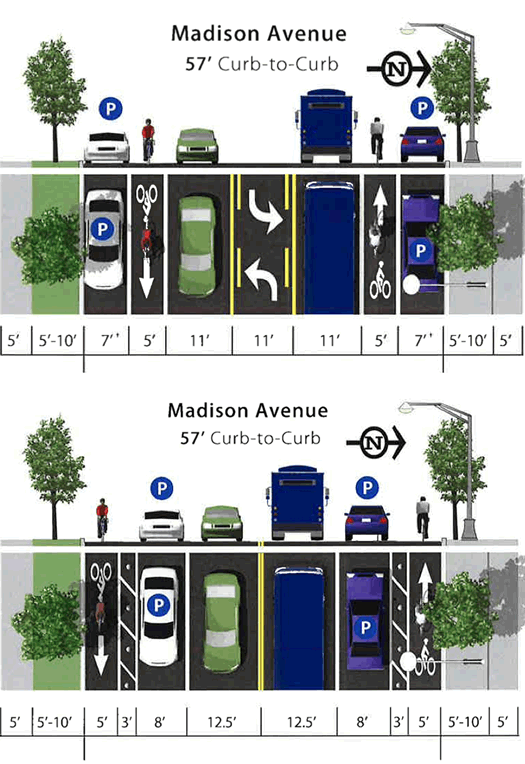 The Madison Ave Road Diet proposal includes a range of options for reconfiguring the street. And based on the public presentation of the options last year, it sounded like some type of bike lane would probably be included. These diagrams -- from two of the presented options -- help illustrate the difference between a "regular" bike lane (top) and a protected bike lane. Cycling advocates argue that protected bike lanes are safer because they separate vehicles from bikes. And they also make people feel safer, encouraging more people to cycle. 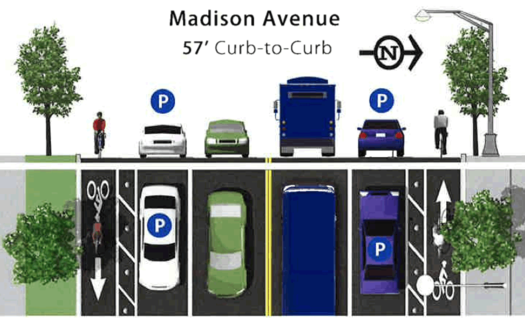 The Madison Ave Road Diet is slated to be implemented in three segments along the corridor from the Madison Ave/Western Ave merge heading downtown to Madison and Lark. So the coalition is proposing that city use the implementation of the first segment -- from South Allen to Partridge -- as an explicit pilot test of the protected bike lane idea. "People can try it for themselves, see what they think about it, see whether it works, and then voice their opinions after they've tried it," said D'Cruz. The coalition backs up its pitch with the argument that laying out the protected bike lanes isn't a large portion of the overall cost of the road diet. (New traffic signals make up the bulk of the cost.) It's essentially just some lines painted on the road, which is relatively easy and cheap to apply -- and to undo. Madison Ave near Saint Rose, which is slated to be the first segment of the road diet. 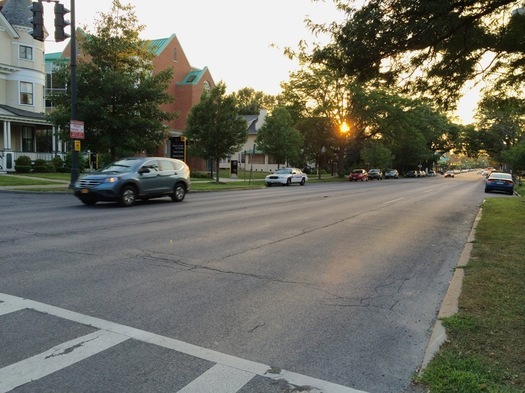 The downside to the pilot is that implementing the idea on a half-mile stretch might not be enough to truly understand the effects of the bike lanes along the important uptown-downtown corridor. In a way, the lanes would be like a bridge that stops before reaching the other side. But D'Cruz argues the segment should still allow the city to gather data and experience on how the lanes affect things like parking and people riding bikes on the sidewalks. "If anything, the danger is that it will undersell the benefits of the protected bike lanes," he said. Other cities have used piloting to test these sorts of ideas. New York City's efforts over the last decade to redesign some of the city's busiest corridors -- such as Broadway through the heart of Manhattan -- involved pilot projects that could be quickly implemented, tested, and adjusted. So, in some sense, piloting protected bike lanes on Madison Ave in Albany would also be like a test of piloting such ideas for the city. Maybe other ideas could also be up for systematic testing -- like adjusting the shape of sidewalks and corners. "There's just tons of possible, reasonable things that people could say [about plans] that end up being false," D'Cruz said to us toward the end of our conversation. "Why don't we have A/B testing for cities? Apply different treatments for streets or areas and see what works best?" If someone tries to build up opposition to entire concept of bike lanes, this is a very smart move. Small problem - 3 lanes MAY work for Madison with traffic light sync, 2 lanes are a no-go. Please note - Vancouver photo (and I've seen same thing in Montreal) shows 2 bike lane on one side of the road - so it doesn't take whooping 16', more like 10'. But that makes to much common sense for Albany. I'd love to see protected bike lanes in Albany... but not at the expense of losing the turning lane in the reduced-lane Madison Ave plan. One person turning across traffic at one of the busier intersections would result in gridlock and insane delays during high-traffic hours. All we have right now are the dumb sharrows which mean nothing to 99% of drivers. Having a bike lane - even unprotected - on Madison Ave is a HUGE WIN for Albany. Needing it all (protected lane) or nothing is insane. "On the other hand, the people who are opposed have common sense conjectures about what might happen if you reduce the number of travel lanes, [...]. But they don't really have any evidence about what will happen." @Paul: One of the options the city displayed last year had both protected bike lanes and a center turn lane (Option C). I should switch it out for that one at the top because I'm guessing whatever configuration the city picks, it will probably include a center turn lane. Here we go again. Albany holds community meetings, get neighborhood groups input, get the city councel input, appoint a committee, call in consultants, then does nothing. Everyone forgets and the project goes away. This has been the way this city has operated for years. Is anyone else disappointed in Kathy Sheehan? Things in Albany still crawl at a snail's pace. I just cannot see why the city is so unmovable. Protected bike lanes work phenomenally in all sorts of cities from New York to Davis to even Fargo. I thought the mayor was going to be an actual progressive. What has she actually done? All of the new developments (which aren't that great to begin with) were conceived when Jennings was mayor. But at least Jennings got stuff done. While I'm in full support for a bike lane, I think the concept of doing a "trial" will be a beneficial exercise not just to the idea of building out better biking infrastructure, but hopefully the unused tool of doing trials for other options that can improve on the livability of the city. Whether it's millennials who are more engaged, the increasing technological solutions democratizing civic management, or a general spirit that people should reclaim the notion that they run the city and shouldn't "rely" on the specialized bureaucrats, I think the idea of what has been coined "tactical urbanism" is a big plus, especially for our fair city. This often includes doing trials to test out concepts, typically on the cheap or at volunteer group's expense, and seeing what sticks and what doesn't. In this case, I hope the city plays along and more importantly is willing to work with other groups or citizens to do similar pilots for other issues that could either shave city costs or improve livability. This has the potential for some exciting synergies!! The Madison Ave. "Road Diet" is happening no matter what the battle is over the configuration of what replaces the current horrible "urban highway." Protected bike lanes would be a great addition, as other commenters state, they work well everywhere they've been built. I've used them in Montreal and it's amazing how easy it is to get around the city on a bicycle when you have infrastructure dedicated to bikes. I ride every day the temperature is above 10F and am forced to use Western Ave because of the state of Madison. The city needs to decide on a plan and move forward. That plan should include some kind of bicycle infrastructure, ideally protected, but if not then anything would be better than nothing. It's 2016, those under 30 are less and less likely to own a car. Let's be smart about how we want to grow the city. 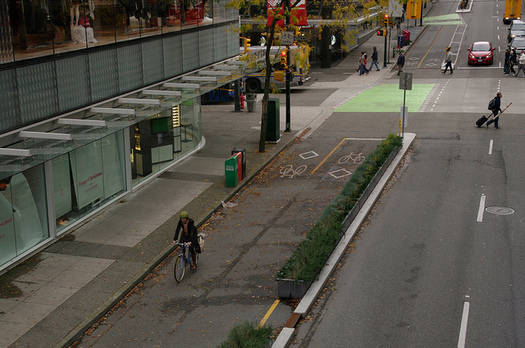 I've ridden on that Vancouver bike lane, as well as drive next to it. It's great! "Is anyone else disappointed in Kathy Sheehan?" A protected bike lane on Madison Ave mean that more people would feel comfortable riding their bikes on this usually-busy street. I ride my bike everyday and always avoid riding on Madison Ave if I can help it because of the amount of traffic, and the terrible state of the road. A protected lane would make riders feel more comfortable and connect the businesses/restaurants of the uptown Madison Area with the downtown/Washington Park area. For those concerned about the center turning lanes, you can read the Protected Bicycle Coalition's report, submitted to the Mayor on November. It includes all 5 options the city presented for a road diet on Madison Ave, and all 5 options include either a center turning lane that runs throughout the corridor (options A & B) or a left-turning bay at intersections to allow for continued traffic flow (options C, D, & E). Also, there are two one-way streets (Partridge and Ontario) along Madison Ave, which means that the need for left-turn bays/lanes would differ according to intersection. It should also be noted that options A, B, & E are not safer for cyclists compared to riding in an otherwise non-bicycle lane road, since bicyclists are sharing the same road space with cars and would still be riding in the 'door zone' of parked cars, while possibly having to negotiate double-parked vehicles on Madison Ave.
We are all for protected lanes but there must be a center turning lane. As of now, it is very difficult trying to exit or enter our driveway with 4 lanes of traffic. With 2 lanes of traffic and no turning lane, I think it would be even more difficult and dangerous especially during business commuting hours.